2. Chop up the veggies and garlic and add everything into a large bowl. 3. Mix the meat and veggies with your hands until everything is combined. 4. Place on sprayed cookie sheet or foil and bake for 35-45 minutes until golden brown. Enjoy with ketchup or your favorite condiment. This is a low calorie, healthy, and easy meal to prepare in less than 10 minutes. For the Cauliflower and Sweet Potato Mash, cut them up in chunks and boil until soft. 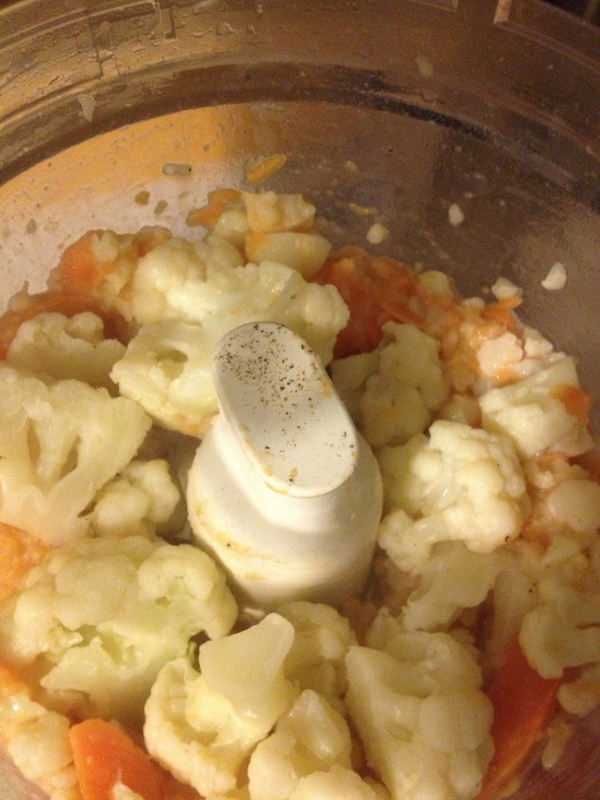 Place the cooked potato and cauliflower into your food processor, adding the almond milk as you pulse. Pulse for as long as you like; the longer the creamier! 2. Cut the top off the squash like you would a pumpkin, remove the seeds and sprinkle some olive oil, salt and pepper inside. 3. Place cut-side down and roast for 20 minutes, or until squash is soft. 4. Remove the squash and let cool. 5. Sprinkle more olive oil, salt, pepper and add the brown sugar to taste! Either scoop the squash out and put it in a bowl or do like I do and eat it right from the squash itself! It’s a squash bowl and It saves me a plate to wash! Just scoop and eat for an easy peesy meal! Preheat the oven to 400. Cut the squash in half, de-seed and place cut-side down on a baking sheet for 20 minutes or until soft. Chop up the bok choy, carrots, garlic and scallions. Place the garlic in a lightly sprayed sauté pan for a good minute before adding the other veggies. Cook until the veggies are soft and browning and remove from the heat. In another sauté pan, add the vinegars, soy sauce, chili paste, peanut butter and chicken broth, heating until it is smooth and almost creamy. Scoop out the squash when it cools and add it and everything else (sauce and veggies) to a sauté pan and heat for 5 minutes or so, mixing well. Squirt the juice from half of a lime on top while it’s cooking. Plate the Pad Thai and garnish with some lime wedges, cilantro and scallions. Enjoy!! -Niccola’s red sauce or your own! 2. Slice your eggplant into one inch think pieces, mine yielded 9 slices. 3. Brush some olive oil, salt and pepper on each slice and place on an un-greased cookie sheet. Bake for 10 minutes and then flip over and bake 10 more minutes. 4. When the eggplant feels soft, take them out of the oven and spread some red sauce on top, sprinkling basil and cheese over. 5. Bake for another ten minutes and let cool. Easy peesy! Each of these is only 100 calories! No guilt! 1. In a large sauté pan, cook the spinach with a bit of olive oil. Place the spinach in a strainer until it cools. Using your hands, ring out the spinach, so that all the remaining water releases. This way you won’t have a soggy calzone! 2. Chop up all the vegetables and place in a large bowl. Add the pesto, some salt and pepper, and mix well. 3. Roll out the pizza dough, using some flour, and try not to make it too thin. 4. Start to layer your vegetables on top of the dough, placing the spinach in between so it’s not directly at the bottom or top. Again, this is so your calzone won’t be soggy! 5. Sprinkle some Italian seasoning on top. 6. Either fold your calzone in a half-moon shape, or fold it like an envelope if you have a lot of extra dough. 7. Lightly brush some of the beaten egg over the seals to ensure the calzone doesn’t open while it’s cooking. 8. Flip the calzone over and place on an un-greased baking sheet or on your pizza stone, like me, for 35-40 minutes or until the edges are golden. Take your smaller squash and cut it in half, de-seed it and place it cut-side down on a baking sheet. Peel the apples and de-core them, cutting them in half, and placing them cut-side down on the sheet too. Bake for 20 minutes or until soft. Chop up all the vegetables. Place them in a sauté pan, adding the tomato last. Cook until everything is brown and smelling good! Take the vegetables and place them in your food processor and pulse well. When the squash is cool enough to handle, scoop it out and place it and the roasted apples into the food processor with the Almond Coconut milk. Pulse well until sauce is thick. To make your “noodles” use a mandolin or finely slice the other butternut squash, with the skin on. Finely slice the eggplant too. Begin to make your lasagna by layering the squash, sauce, eggplants and cheese in your baking dish. You can do it how you want but I did it this way…lightly coat the bottom of the dish with the sauce then add the squash, a layer of spinach, sauce, eggplant, spinach, eggplant/squash, sauce again and finally a thin layer of cheese. I didn’t have any shredded cheese left so this looks a bit funny with my Veggie Cheese slices! Bake in the oven at 375 for one hour of until the lasagna starts bubbling along the sides! Manga! Run to Trader Joe’s and grab some of this! I had never even seen black garlic before and the taste is like none other! It’s just what every Italian girl needs! Preheat the oven to 400. Cut the spaghetti squash in half and de-seed. 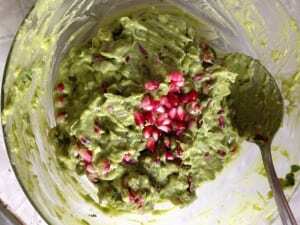 Save the seeds for the pepita recipe below! Place them cut side down on a baking sheet and cook for 20 minutes or until soft. If you’re using frozen peas or broccoli, get them ready and then place them, with the garlic, in a saucepan. Add the olive oil. Sauté the vegetables until they start to brown. When the squash is cool enough to handle, scoop it all out and add it to a large bowl. Add the vegetables, cheese and milk into the squash “macaroni” and stir well, adding salt and pepper to taste! Wallah! No noodle macaroni and cheese! Healthy and delicious! 2. Wash the squash and using a heavy knife, cut the top off as if you were about to carve a pumpkin. 3. Scoop out the seeds and save them for later. 4. 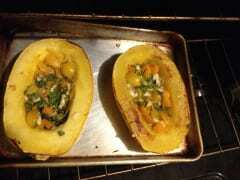 Sprinkle some olive oil, salt and pepper on the squash and place cut-side down on a baking sheet. 5. Bake for 30 minutes until squash is soft and brown around the edges. 6. ￼Let cool and add some brown sugar. Enjoy! This is quite filling! Cut the avocados in half, scoop out the flesh and mash well in a large bowl. Chop up the onion, cilantro, garlic and Serrano pepper and add to the bowl. Cut the pomegranate in quarters and using your fingers, bend each section and remove the seeds from the pith. Wear an apron to avoid red splatter on your clothing! 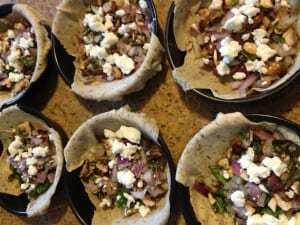 Add the pomegranate seeds and mix well. Add the lime juice last and serve chilled. Healthy and colorful! Enjoy! Add a few seeds on top as a nice garnish! Preheat the oven to 350 degrees. Cut the pumpkins in half, sprinkle with olive oil, salt and pepper and place cut-side down on an un-greased cookie sheet. Bake for 20 minutes or until soft. You don’t need to take the seeds out! Cook the quinoa with 2 cups of water and bring to a boil. Cover, place on low heat and cook for 15 minutes or until all the water has evaporated. Chop up the scallions and the apricots. When the pumpkin is done cooking, scoop out the insides and toss in with the quinoa, scallions and apricots. Stir well, adding some olive oil, salt and pepper. Serve warm and garnish with some nuts and apricots! Easy peesy! Preheat oven to 350. Scoops seeds out and brush squash with olive oil, salt and pepper. Lay cut side down on a cookie sheet and bake for about 30 minutes. 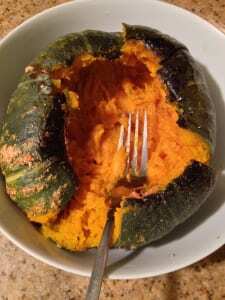 Test squash with fork to see if it’s soft. Toss all the ingredients in a bowl and mix. Add to middle of your cooked squash and bake for an extra five minutes to warm filling! 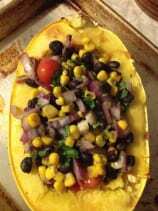 My second favorite way of preparing the squash is southwestern style. It gives the meal a real kick and is an easy way to use leftovers from Taco Night! Cook the squash the same way except add these ingredients down below instead. Wallah! Lightly spray your baking dish and place aside. Slice the vegetables one inch thick and chop up all the herbs. Start to layer your baking dish. I did eggplant, onion, yellow squash and zucchinis, sweet potato, peppers, tomatoes, salt, pepper, herbs and then cheese last. Place in the oven for 45 minutes or until vegetables are browning and soft. Enjoy this low-calorie, guilt free entree! Preheat oven to 350. In large pan, spray coconut non-stick and sautee’ onions, mushrooms and spinach together until golden brown. In separate pot, boil 3 cups water with broccoli until tender. Add the veggies and broccoli together. Beat the eggs, milk and cheese together with salt and pepper and add to veggie mix. Stir all of the ingredients together and layer into a greased round or square baking dish. Grate a little of the cheese on top and bake for 40 minutes or until set. 2. Roll out your dough or use your Kitchen Aid attachment to create 4 strips of dough. I flour my Kitchen Aid too. 3. Spread your dough on your floured pizza paddle to make the sliding, on and off, easier. Spread red sauce on top. 4. Add your toppings, cheese last. Slide into oven. 5. Cook each pizza for about 12-18 minutes or until edges are brown and crispy. 6. In a large bowl, add your greens, dressing lightly with olive oil and balsamic vinegar. Toss the salad and spread over pizza. I like to add red pepper chili flakes on top too. It’s a pizza-salad, paisano! Add a generous amount of salad on top! -Greens, tomatoes, onions, cornichons, mustard, peppers, and whatever else you take on your burger! 1. Preheat oven to 350. Take the stem out of the mushroom and scoop out the middle part. 2. Drizzle oil and balsamic onto cap, salt, pepper and seasoning. 3. Place in oven for 10 minutes and lightly toast bun during last minute or so, adding goat cheese to cap at the same time. 4. Place your cap on bun, add greens, produce and condiments and EAT! The Tolosa Syrah from Kent paired beautifully! Preheat the oven to 350. Roll out the dough and cut in squares slightly larger than the size of the tart pans you are using. Lie the squares of dough on the tart pans. In a bowl, combine everything but the tomatoes and goat cheese. Put an ample amount of the filling in each shell. 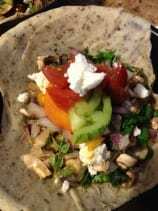 On top of the herbs and such, evenly layer the tomatoes and take little clumps of goat cheese and crumble it on top. Lightly drizzle some of your olive oil to top. Bake for 10-15 minutes or until dough becomes golden brown at the edges. Enjoy! They make for a fantastic presentation! 1. Bring to a boil 2 cups water and add the Harvest Grains. I did not add butter like the directions say. Bring to a boil again, then cover, turn heat on low and simmer for 8-10 minutes. 3. Preheat oven to 350 and cut the tops off the peppers, keeping them in tact. They look cute as hats on top! 4. Scoop out the seeds and stuff the peppers with the grain mix. Put the tops/hats on and drizzle with some olive oil, salt and pepper. 5. Bake for 20 minutes or until peppers are browning. Enjoy! 1. Preheat oven to 400. Cut the squash length wise, removing the seeds. 2. Place some olive oil and salt and pepper on the squash and place cut-side down on a sheet tray. Cook for 20 minutes or until tender. Scoop out the “spaghetti” from the squash and place aside. 3. In the meantime, chop up the veggies and sauté the onions, mushrooms, zucchini and garlic. Add the greens last. 4. When the squash has cooled, take out a pie pan and press the meat of the squash into the bowl to form the crust. Try to even it out as best you can. 5. Beat the eggs with the coconut milk and add the veggies in and stir. 6. Pour the veggie mixture into the pie pan and add your tomatoes on the top. I sprinkled just a bit of the Trader Joe’s spotlight cheese, Elderflower Tomme, on top. It’s not necessary though; this can easily be made dairy-free too. 7. Bake at 375 degrees for 45 minutes or until set. Finely chop the shallot and cloves of garlic. In a small pan, brown them with a bit of butter or olive oil. In a small pan, add the wine, lemon juice and clams, garlic and shallot mixture, and bring to boil over medium heat. Within two minutes, the clams will open. Remove pan from heat and pour into bowl. Add fresh basil on top and toast your roll. I love these nut packets for salads! Almonds, walnuts, sunflower seeds and cranberries! And only 170 calories a packet! Wash your kale and pat dry. Then seperate the green thick colored stems from the kale. Take the long pieces of kale and roll them up tight and then cut into them 2-3 times creating ribbons when they unroll. Take the kale ribbons and place them in a large bowl. Drizzle the olive oil, the lemon juice and salt on top. Using your hands, massage the kale for 2 minutes with the olive oil, salt and lemon juice that’s in the bowl. When the kale starts to loosen and soften, you’ll know it’s done. Add the chopped onion, cucumber, avocado and nuts to the bowl and toss well. Use the citrus dressing below to top it off!